It’s official! After months of planning, shooting, and editing, season 2 of Steven Raichlen’s popular Project Smoke launches on Public Television this Memorial Day weekend. This year’s show is even smokier and more insanely mouth-watering than ever. In Project Smoke 2 Steven focuses on foods—and drinks—you never dreamed you could smoke. From sangria made with fire-charred fruit to a luscious smoked chocolate bread pudding. From hay-smoked mozzarella (and mozzarella grilled in lemon leaves) to spectacular spruce-smoked T-bones. We’ll show you how to cure and smoke spareribs like ham and how to cold-smoke salmon with Scotch whisky. We’ll sharpen your appetite with Chinatown ribs and bacon, ham and cheese chicken thighs and slake your thirst with mezcalinis (think cross between a mojito and margarita) and a “dragon’s breath cocktail” served in a smoking brandy snifter. In a field long dominated by low and slow smoking, we devote an entire episode to Smoke in a Hurry, featuring four dishes you can smoke in 10 minutes or less. Our Asian Smoke show explores smoked foods of the East. Our Rise and Smoke show tells you how to smoke breakfast. So what else is new in Steven Raichlen’s Project Smoke season 2? Just about everything! New smokers and grills—from a high-performance Komodo Kamado ceramic cooker from Indonesia to a Yoder offset smoker so big we roll it onto the set on fat tires. You’ll learn how to smoke with handheld smokers, stovetop smokers, water- and pellet-smokers, and even on a gas grill. Revolutionary smoking techniques such as reverse-searing, rotisserie-smoking, and “caveman” smoking on a bed of hot embers. We’ll get creative by smoking food with wood, hay, cinnamon sticks, sugar cane, lemon leaves, and coffee wood. A stunning new location in Palm Springs, California, with a backdrop featuring a lake, palm trees, hillsides, and snow-capped mountains. Mouthwatering new dishes like Candied Bacon, Smoked Shrimp and Corn Chowder, Buccaneer Chicken, Pork Belly Steamed Buns, Tangerine Smoked Flans and a television first: Smoked Ice Cream. What hasn’t changed is Raichlen’s cogent instruction, cutting-edge techniques, fascinating cultural asides, and his commitment to giving actionable information people need to turn out smokehouse quality meats, seafood, vegetables, and desserts from your smoker or grill. For airtimes in YOUR area, visit stevenraichlen.com. And please contact your local Public Television station to make sure they plan to carry Project Smoke in your area. And don’t forget to order the companion book, Steven Raichlen’s awesome new Project Smoke (Workman Publishing, 2016). 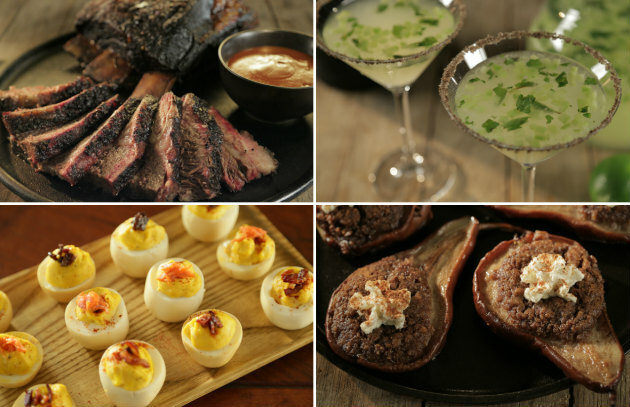 To celebrate the holiday weekend, we’ve created a menu of Project Smoke favorites.